P&O Ferries has seen a 20% increase in users on its e-commerce website, which it launched just before Christmas. This has led to an increase in its conversion rates from the website, provided by SAP’s Hybris software. Speaking to Computer Weekly, CIO Chris Cook says its old website was very old fashioned, while the new Hybris B2C website is “much more modern, easy, and user friendly, and is very easy to launch new promotions”. 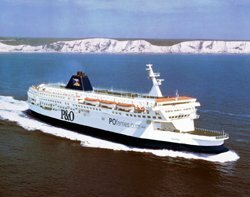 The website project took a little over a year, and is P&O’s first major step in its three to four year programme to replace its legacy IT systems. “I think it’s a problem for a lot of travel companies, who have booking and scheduling systems dating back to the ‘70s. And we have our fair share,” Cook says. Cook explains that P&O Ferries has been relying on an old back-end system called Dolphin for the last 30 years. Hybris replaces one part of this legacy system, but the ferry operator is still using Dolphin for its B2B and travel agent business, as well as scheduling and port management systems. This makes legacy replacement a substantial task for the company but, following the success of its first step at refreshing e-commerce, Cook expects it to take another two to three years to move the rest of its estate onto Hybris. “It’s a bad situation to be reliant on a 30 year old system,” adds Cook. “But Hybris is not just a website, or just an e-commerce platform – the flexibility has enabled us to build in things like our price model and made us no longer dependent on Dolphin. “The next step is to remove dependency on Dolphin altogether, by interfacing Hybris into our finance system. Previously the distinct channels were divided into separate silos. If a customer started their booking online, but wanted more information from the contact callcentre, the person on the other end of the phone would have no information about the partial booking. “It’s a fantastic opportunity to manage our customer interaction across multiple channels,” says Cook. P&O Ferries used the Gartner Quadrant to review the leading e-commerce platforms, which also include Oracle and IBM. Cook says Hybris was the most modern and flexible product, and best fitted the business. “We’ve been very impressed with the functionality from Hybris and the support they’ve given,” he says.